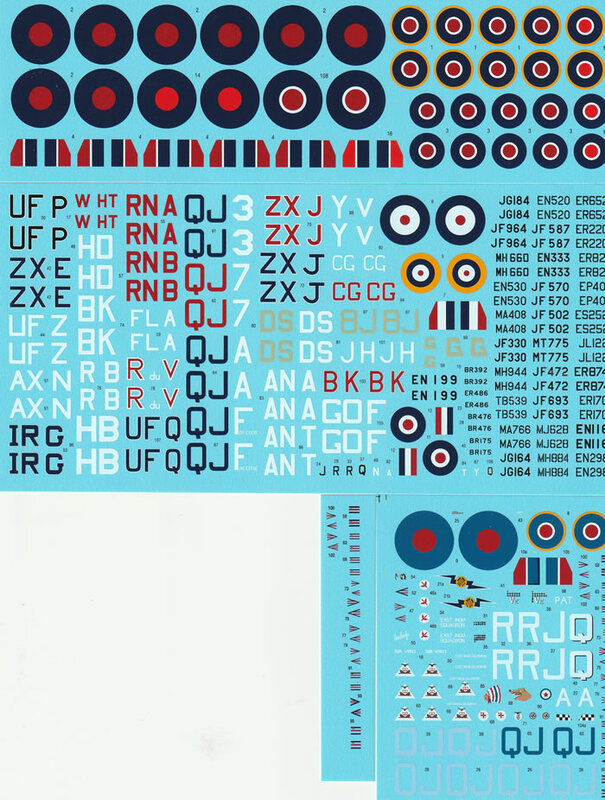 Decals for 36 subjects with colour-printed painting & markings guide. Excellent production quality. Good value per scheme.. These are superbly well produced decals, and represent excellent unit value given the large number of subjects. They enable Spitfires of 36 Mediterranean Theatre aces to be modelled in 1/72, which many Spitfire fans will welcome. 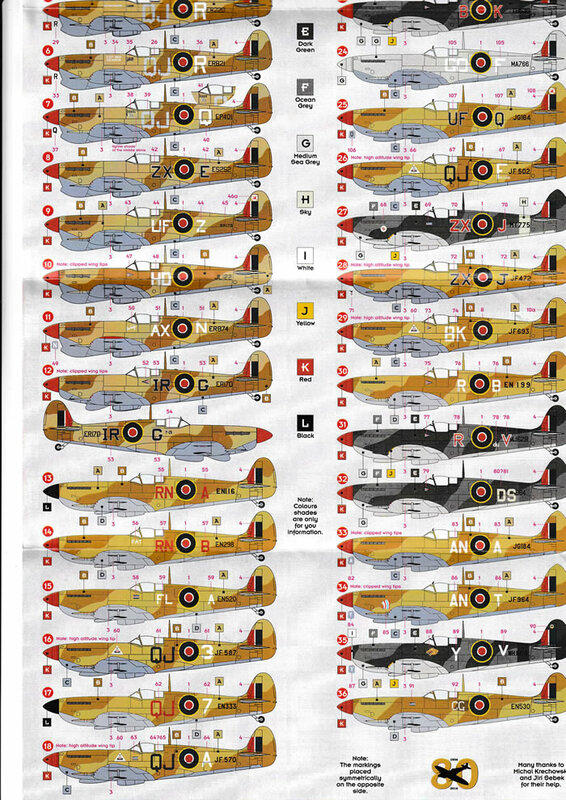 This comprehensive set of decals provides 36 options covering Spitfire Marks Vb, Vc, VIII, IX and IXe flown by aces in the Mediterranean Theatre of Operations. DK Decals are usually supplied in an A5 ziplock plastic bag, and these are no exception although the instructions are on a custom 400 x 210mm colour sheet and are folded in four rather than the usual A4 page folded in three to enclose the decals sheets and their protective tissue paper. The instructions are very nicely produced in colour on glossy paper, and clearly indicate markings placement. The historical notes regarding the aircraft and its pilot is listed in a separate box and keyed to each subject. Colour call outs are listed using MAP colours and referenced to the Humbrol and Agama paint ranges. Each scheme is illustrated using a single side-profile view, with 12 rather smaller plan views These profiles are about as small as one would want them to get, but are adequate for decal placement and camouflage schemes. When they are scanned they can be enlarged somewhat. About four-fifths of the schemes are in the desert scheme but there are seven wearing the European Temperate Scheme and one in the High Altitude Scheme. These markings for mounts of aces come from about 10 squadrons – you can do your own research to identify them. A few are different planes flown by the same pilot – Neville Duke gets three! The schemes cover the following pilots. Their scores of aircraft shot down are presented in the instructions. In a couple of cases the usual qualifying score of five has been waived to give an interesting scheme. There is the usual disclaimer about camouflage patterns being a reconstruction of possible appearance. The patterns apparent in reference photos have been assumed to correspond to standard patterns, as one almost never gets multiple pictures of a particular subject. This is a known pitfall of pretty much all decal subjects and must be accepted. The decals are printed by BOA and appear to be of high quality, with excellent registration, good colour density, and a gloss finish. In my hands they have previously performed well and these should be the same. The decals come supplied on four sheets. They include serial numbers and codes covering all thirty-six options, with sufficient national insignia for five or six aircraft, particularly non-standard ones. Smaller sheets cover personal markings and rank pennants. 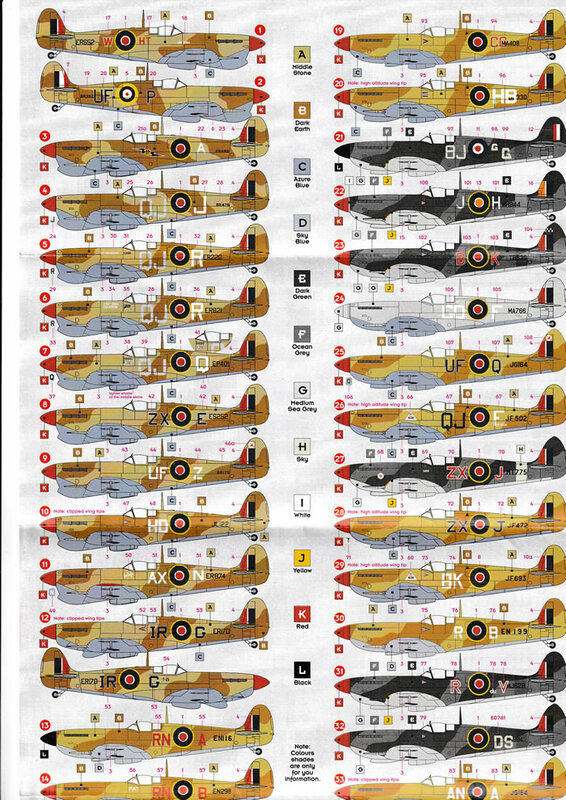 Using the decals supplied with most kits it should be possible to build all 36 aircraft from this decal set. This is beyond the scope of most modellers (including the reviewer) and one has to ponder the economics. It would make an excellent joint purchase for a couple of like-minded modellers but one has to wonder whether DK Decals might have made twice as much profit from selling two sets of 18 aircraft at two thirds of the cost? Feedback from readers would be most interesting.